Fosamax and other bisphosphonate drugs have to be among the most harmful drugs that have ever been prescribed in modern medicine. They are increasingly associated with a long list of feared diseases, including cancer, heart failure, liver damage and dementia. Despite these being prescribed to prevent osteoporosis, the evidence is that they actually increase bone fracture! It is no medical mystery why this happens: Bisphosphonates are a poison that should never be put into a human being. It is particularly toxic to bone cells (I explain their action in this article here). While there may be a brief reduction of bone fracture, this is quickly replaced by increased rates of catastrophic bone death. 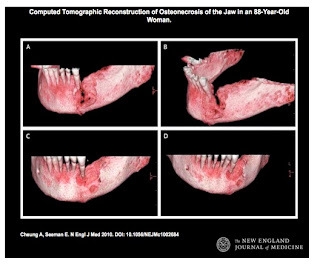 This includes osteonecrosis of the jaw which is about the worst disfigurement one could ever wish upon a person - Horrific! An example of "Fossy Hip"
Here in New Zealand, despite the growing evidence of horrific harm, media personalities, like Jude Dobson, continue to reassuringly purr on during prime time television about the wonderful benefits of these drugs. I wonder how much she is being paid? Meanwhile, the campaign to terrorise women about osteoporosis continues while offering only one solution: Harmful megadoses of synthetic vitamin D along with bone-killing bispohosphonates. Of course, there are safe and effective alternatives but these get no mainstream attention because there is no money in them. The sale of bisphosphonates drugs is a billion dollar industry worldwide and the profits far exceed any expense from consequent law suits. Also bear in mind that many of the elderly women who suffer bone death end up dying before they can sue the culprits! Those that do sue face years of legal torture by defendants with bottomless pockets and many will be sidelined due to ill health, as the article below highlights for one of the first cases to go before the New Jersey courts. This whole business is medical madness, if you ask me. How come this scandal is not headline news in New Zealand and elsewhere? Meanwhile these drugs continue to be advertised on New Zealand television. Is it because of the money? What about the health of the people taking it? Don't they have the right to know? What is the responsibility of the prescribing physician who must surely be aware of the thousands of lawsuits in the USA alone? Please read the article below and follow the links and you will see that I am not alone in thinking this is crazy stuff. About five months ago we posted "March 2013 Fosamax Product Liability Litigation Update: Femur Fracture Cases Against Merck -- December 31, 2012 Totals: 2,075 New Jersey (NJ) State Court Lawsuits, With 820 Cases Pending In Federal Court Fosamax MDL And 420 California Claims". As seen in Merck's SEC filing for the second quarter of 2013, the number of Fosamax cases alleging femur fracture as the drug injury -- as opposed to osteonecrosis of the jaw (ONJ) -- is growing albeit at a relatively modest rate. And that total number will certainly get higher as we and other law firms around the country continue to investigate for litigation new Fosamax - femur fracture cases that will eventually be filed as lawsuits. 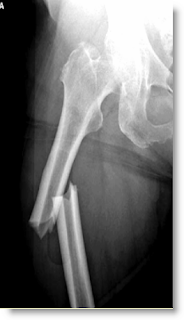 As of June 30, 2013, approximately 2,660 cases alleging Femur Fractures have been filed in New Jersey state court and are pending before Judge Higbee in Atlantic County Superior Court. The parties have selected an initial group of 30 cases to be reviewed through fact discovery. The first trial of the New Jersey state Femur Fracture cases, Su v. Merck, began on March 11, 2013, but a mistrial was declared on March 28, 2013 after the plaintiff suffered a serious medical issue unrelated to her use of Fosamax that prevented her from proceeding with the trial. The next trial, Unanski v. Merck, was set to be tried beginning November 4, 2013, but has been continued and is expected to be tried in 2014. Here is the Google search string for most of the articles I have written about bisphosphonates.